In the post-Snowden world, encryption is cool. Lots of personal messaging apps want to cash in on privacy. Wickr is one of them. It's a free app that offers self-destructing, encrypted messages. But its founder, Nico Sell, sees vast and untapped potential in the finance industry. To her, Wickr is more than a cross between WhatsApp and Snapchat. 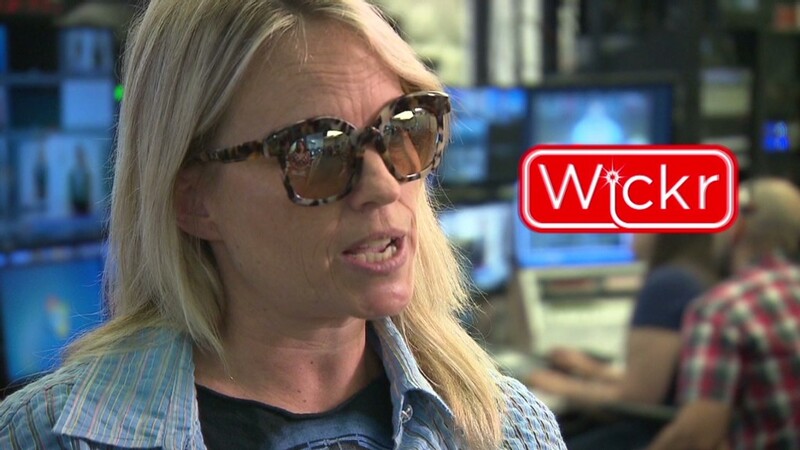 "Our goal as Wickr is to run all the financial transactions in the world," she said. That's a lofty aspiration, especially for a company that's not profitable. But Sell wants you to think of Wickr as more than a social platform. She imagines it running in the background at big banks and stock markets. Consider the startup's latest round of funding. It raised $30 million from a band of investors that included CME Group (CME), which runs the Chicago and New York mercantile exchanges. CME Group wouldn't say exactly how they plan to incorporate Wickr's technology into the commodity future trading that goes on at its exchanges. But there are at least two obvious uses: securing the communication that initiates millions of dollars of trades a day -- and keeping chats between stock brokers and traders secret. The draw? How Wickr claims to work. Text, photo, video and audio is encrypted into indecipherable code before it leaves your device. So, it's safely guarded as it travels via airwaves and wires to Wickr's computer servers and eventually to another person's device. Meanwhile, you can destroy messages you send by setting a timer. Theoretically, this system protects you from hackers and government snooping. Anyone listening in can't figure out what's being sent. Wickr hasn't let the public dig through its code openly and look for holes. But outside experts at digital forensics company Stroz Friedberg have said Wickr is keeping to its promise of using top-of-the-line encryption and leaving behind no metadata. And there's another aspect the finance industry might love. Imagine emails, trades and other sensitive files with an expiration date. Currently, the Securities and Exchange Commission requires accounting firms to keep their audit records for seven years. In criminal cases, regulators can look back and find evidence of misconduct. Finance companies would be smart to destroy those records at the appropriate time. In reality, they don't. "No one does, because they have no idea when that message was created," Sell said. "You have all this stuff waiting around for 10 or 15 years, and it becomes hazardous waste." As for worries that traders will use this future Wickr-inspired platform to engage in criminal behavior, Sell said she's currently devising a system that would allow the SEC limited access to traders' conversations -- but not all at once. Sell promised any solution wouldn't allow for NSA-style dragnets. Then again, she acknowledged that traders can already keep secrets from the government by using the current Wickr messaging app.